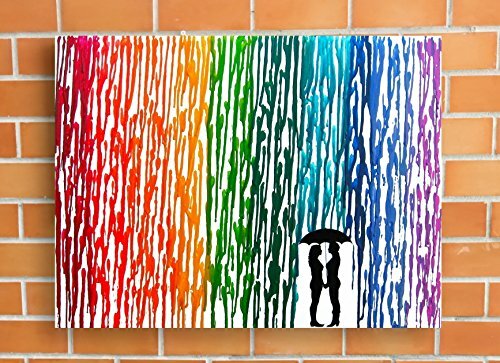 Lesbian Wedding Gift, Rainbow Melted Crayon Art, Gifts For Lesbian Couple, In The Rain Painting 16x20"
Each melted crayon art painting that I create is made with love and is absolutely one of a kind. These make a great present for a wedding, anniversary, or any special occasion that you need a really special gift for. I designed a silhouette of a girl couple embracing in the rain, sharing an umbrella, symbolizing the strength of their love. My designs are made into vinyl decals, which are placed into all my scenes. I spend hours in my steamy garage in Florida dripping hot wax onto the canvas, to create the rain effects. It is kind of a dangerous job! Then in the final production I carefully remove the covering with a hot blade, as to not disturb the wax. I carefully trim any excess wax from the edges of the canvas and do any last minute tweaks that are needed. Signed on the side. Want to add a couple's names and/or wedding date? Customize it! In the drop down menus, please include the names or text, and the wedding dates you would like. I will make creative decisions about the sizing and fonts of the text. The last photos show my work with blue skies and grass added. Adding grass and blue skies won't add any production time, but adding names or wedding dates will add approx. an extra week to production. If you like these extra options, please choose from drop down menus. This will look great on any wall color and will definitely be a conversation piece for guests. My paintings have traveled safely all over the globe, using custom sized boxes, insured through USPS. Please let me know if you have any questions before purchasing my art. Thanks! If you have any questions about this product by Fem By Design, contact us by completing and submitting the form below. If you are looking for a specif part number, please include it with your message.